Okay, I decided to up by Reading Challenge Game in 2018. The next one I’m talking about is one I’m really looking forward to tackling. 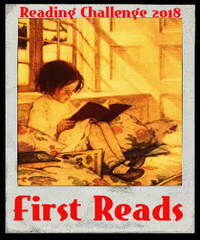 Do you remember the feeling when you read the first book by your favourite author? Yes well, its for that feeling that I have come up with this challenge. Also, there was a time when I would only stick to the books written by authors I had previously read and enjoyed. But soon I realised that I was missing out on a lot other books. So, readers & bloggers, come together to this challenge that will make you pick up books by authors that you haven’t read before! You never know, you just might find another author to love and follow. 1. Read & Review as many books as possible, by authors that YOU haven’t read before. Sign Up Here. I’m at least going for the Lover level, maybe the Expert.